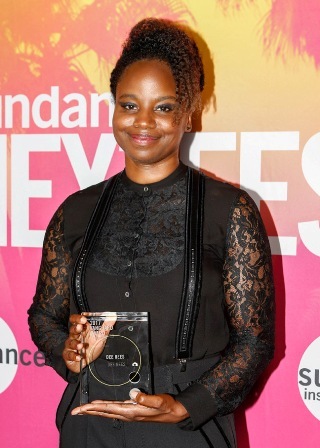 The 2017 Sundance Institute Vanguard Award was presented to filmmaker Dee Rees at the Sundance Next Fest, in Los Angeles. Rees credits include “Pariah”, HBO biopic “Bessie” and “Mudbound”, which has been building positive word-of-mouth and strong praise from finicky film critics since it screened at the 2017 Sundance Film Festival. Often called a “vanguard” for her independent thinking — from the very beginning—it’s her reputation of putting in the work that really garners her such industry respect. Rees’ roots with the festival run deep — starting with her NYU thesis of the short film version of that would become her full-length “Pariah”. This helped get her noticed by the Sundance Institute, leading to what is now a ten-year-long relationship with both the organization and its affiliated festival. The Vanguard Award presented by Acura was founded in 2011 to mark the 30th anniversary of the Sundance Institute Feature Film Program and its founding director, Michelle Satter. It celebrates an emerging artist with creative independence and includes a cash grant and mentorship from industry professionals and Institute staff. In Hollywood, it might appear that receiving an award is rather easy but earning a Sundance Institute Vanguard Award requires significant “skin in the game”, because in celebrating an artists independent spirit, it’s also highlighting their creative resourcefulness at making their dreams materialize without the deep pockets of Hollywood and the laundry list of compromises that often accompany entrance into Tinseltown’s inner circle. Rees is an alumna of the Sundance Institute Screenwriters, Creative Producing and Directors Labs and has been the recipient of the Institute’s Time Warner Fellowship and Annenberg Film Fellowship. Rees is the sixth recipient of Sundance Institute Vanguard Award; past recipients include Damien Chazelle (“Whiplash”), BenhZeitlin (“Beasts of the Southern Wild”) and Ryan Coogler (“Fruitvale Station”). Her next feature, “Mudbound” is adapted by Rees and co-writer Virgil Williams from Hillary Jordan’s remarkable debut novel, Mudbound. Rees preserves Jordan’s strategy of spreading the narration between six different characters, three from each family. It’s a powerful equalizing device that puts everyone on roughly the same level, despite the fact that the Jacksons are not only tenant ­farmers on the McAllans’ land, but African-American to boot, locking them into a lower social position in 1940s Mississippi. The historic drama “Mudbound” sold to Netflix for $12.5 million. The Sundance Next Fest ran August 10 – 13 in Los Angeles.